The internet is one of those very useful inventions which has changed our lifestyle and made things easier for us . But it is said , every thing has two aspects , dark aspect and bright aspect and similarly hackers , cyber criminals and adult content/websites are a few dark aspects of the internet . That’s why , having a foolproof , reputable and good internet security and antivirus software has become an extremely mandatory necessity for every internet user to avoid a big disaster to occur . Whenever someone mention McAfee , Its users feel secure there self . Because McAfee is a very prominent name in industry of security products . McAfee internet security 2017 has been released recently . For my respectable readers , the good news is that now everyone can use McAfee internet security 2017 for free for 6 months instead of its one moth free trial . Let’s have a look at its security features before grabbing this security freebie . Apart from all security risks , Adult websites contain harmful content are a cruse and a big headache for parents . Kids are ingenuous or innocent by nature and they don’t have apperception to measure , what’s wrong and what is useful . Here McAfee internet security 2017 can help those parents , who are concerned about the online activities of their children . McAfee internet security 2017 comes with an effective Parental Control . Using this awesome feature , you can block all inappropriate websites and as well as you are able to set time limits for Internet use . What have done your children in your absence ? You can check user login times, attempts to access forbidden websites, and total time spent online through a detailed usage report . This one of the best internet security antivirus softwares stay safe you from all types of offline and online security threads such as Trojans, viruses, spyware, rootkits, and you also get a state-of-the-art anti-malware protection . Its faster and advanced scanning engine checks for threats quickly without compromising battery and system performance . With the help of McAfee ActiveProtection and NetGuard , you can enjoy risk free searching , browsing and downloading experience . McAfee internet security 2017 has a smart Spam and Dangerous Email Filter , which enables you check your Inbox fearlessly . McAfee internet security 2017 also comes with easy to use Privacy and PC Optimization Tools , Its McAfee Vulnerability Scanner can find and patch holes in Windows and installed applications . Using McAfee QuickClean , you can delete unnecessary files and enhance your computer/laptop’s overall speed and performance . McAfee Shredder will help you destroy sensitive files securely . In addition , It comes with Two-Way Firewall , Network Intrusion Security . 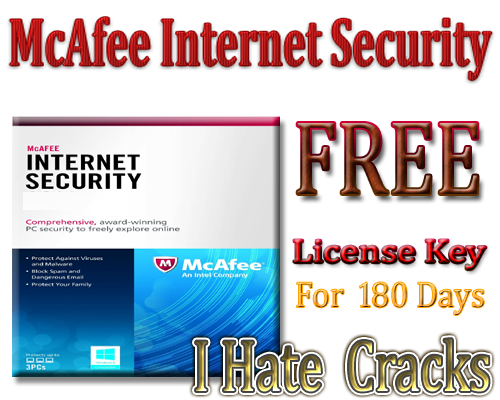 McAfee internet security 2017 is normally available priced at $19.99 . But you can use it for free for 6 months .